3D scanning remained expensive technology where getting high quality scans is a challenge. Qlone is launched by Israeli Company Eyecue Vision Technologies. 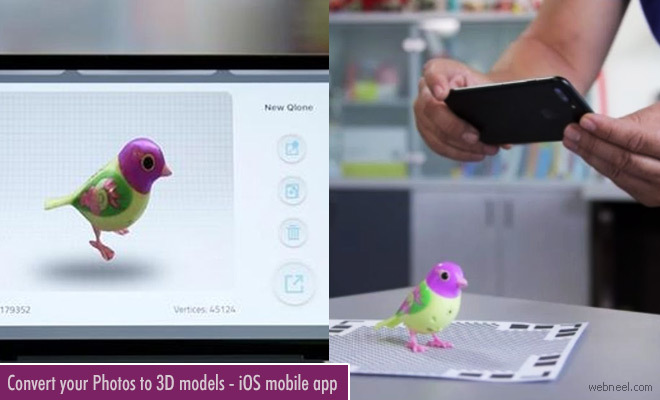 With this app 3D scanning has become an everyday activity which enables user to explore the rapidly growing 3D industry. Quilon app is user friendly, free to download software which uses device's camera and an augumented reality mat to modify 2d photographic images into full three dimentional images. Scanning an object using Qlone is extremely easy process. Print the included AR mat, place your object in the middle of the mat and let the Augmented Reality dome guide you through the scanning process. Scan the object from two different angles and it will be auto merged for better and more complete 3D results. The 3D images are cleaned up, optimised and modified in the app itself with quilon's extensive range of integrated editing tools like texture, art, sculpt, clean and resize. Sharing of the edited images directly to facebook, whatsapp or Instagram is an added advantage.